Car market with tariffs, and export restraints - FreeEconHelp.com, Learning Economics... Solved! Suppose that the demand function for American cars here in Cuba was Q=60-4P, where P is the price charged in hundreds of thousands of dollars and Q is the number of cars (in thousands) sold in Cuba each year. (a) If the supply schedule is horizontal at a price of $1,000,000, how many American cars would be sold in Cuba? (b) How much money will be spent by Cuban consumers on American cars? (c) In order to raise revenue, the government of Cuba decides to impose a tariff of 50% on all American cars. How many cars will be sold now? (e) How much revenue will the Cuban government collect with this tariff? (f) Suppose that instead of the tariff, America convinces the United States automobile manufacturers to impose a voluntary export restraint and limit their production of cars for Cuba to 15,000. If this is the case, what will be the price paid for American cars in Cuba? (g) What will be the amount that a US firm would be willing to pay the US government for an export license? (h) How much will be the US government’s total revenue from the sale of export licenses? 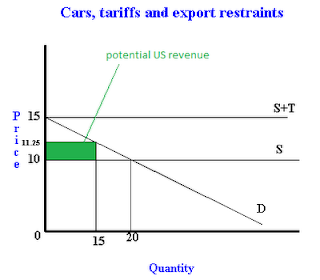 (i) Why might the US prefer export restraints to a tariff? For a) the price is basically 10 (1,000,000/100,000) so we can plug this into our demand function to get a Q of 20 (60-40) which then gets multiplied by 1,000 so we get 20,000 cars. The possible reason for the supply curve being horizontal is that Cuba is a relatively small country compared to the United States. This means that any change in demand for cars in Cuba has no effect on the supply curve, because the firms in America can sell the cars for that same price elsewhere, so if someone in Cuba really wants to get an American card they need to pay the price of $1,000,000 (for 1 thousand cars). In order to get b) you multiply the price of the cars times the quantity of cars being purchased. You already know the quantity of cars being bought from a), and we know the purchase price from the information above. A tariff means that imports are now taxes, so we can increase the price of a car by 50%. The price of a car used to be $1,000,000 so multiply this price times 50% to get the value of the tariff, then add the two of them together to get the new price with the tariff added. In order to calculate the new equilibrium quantity, we have to plug the new price into the demand function and solve for Q. Which will give us the new equilibrium quantity of 0. The new price will be $1,500,000 and the Cuban government will make no money. The amount that a US firm would be willing to pay to get an export license would be the amount equal to the difference between the price they are willing to accept ($1,000,000) and the price they are receiving ($1,125,000) so $125,000. If they have to pay more than this amount then they are losing money and would rather do nothing. If they pay less than this amount then they are making more money than they normally would make and are very happy. So they are willing to pay up to this amount to make it happen. There is no way to answer h) without information on the number of firms, and how much export licenses actually cost. My best guess will be that firms will pay the highest amount, so we can multiply $125,000 times the amount sold of 15 to get $1,875,000. The US getting this amount would mean that all of the economic profit has been extracted from the firms in the form of government revenue. The US prefers this because they get the money instead of Cuba. Also, more cars are sold which helps American companies. Yeah its a good comparison of traffis with car market. i have a little but idea about it before reading this blog but now i get it properly. Nice work done on this blog, its very informative and according to my interest. However if you want to track your car so side a look on Mazda VIN Decoder. The present retreat has not hurt Car producing in China, truth be told its official now that neighborhood interest for autos has surpassed the USA. China now is the World's greatest auto market. How can this influence the Global economy, and what is the future for Chinese automobile makers? At the point when the economy goes south, by and large the new car market gets pounded, and the utilized car market grabs somewhat. Amid a monetary recuperation, which is the thing that we are encountering now the United States, generally new car deals take off, and the utilized car market contracts, yet this time there are different changes, and contributing components hatching.